James & Mary Potter (5652) F? 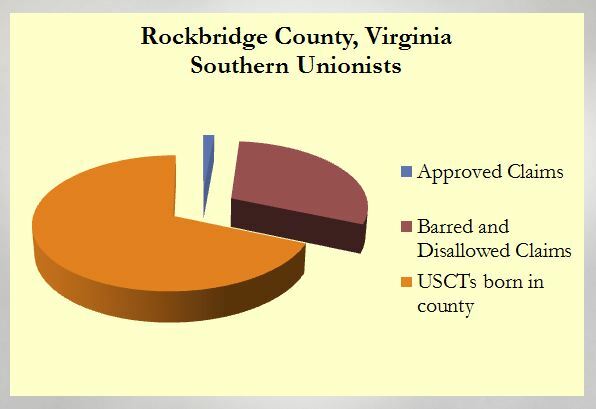 Note: This is a believed to be a relatively complete listing of those identified as Unionists in Rockbridge County, Virginia. As others are identified, they will be added. Robert Henry Allen married Harriet Cousins on October 28, 1860 in Ross County, Ohio. In 1863, he is listed on the draft registration for Huntington Twp., Ross County, Ohio, as a thirty-three-year-old black, married farmer. He was drafted in Chillicothe, Ross County, in June 1864 and joined the 27th USCT, Company I, for three years. On October 17, 1864, he was transferred to the 23rd USCT, Company I, and served until November 30, 1865. He is listed (with over 100 other men who served in the 27th USCT) in the History of Ross and Highland Counties, Ohio section on Civil War soldiers. It also includes reference to his transfer to the 23rd (along with four others). He died in 1866. I have a record that shows his buried in Cousins Cemetery, Row 10, Grave 24, with a government headstone, in Pike County. In 1890, pension applications were filed for Harriet Prichard as widow and Annie Harris as minor. When I attempted to view them at the National Archives, the request sheet came back marked that they could not find the file. It appears that his parents were Robert and Hannah, also born in Virginia. They lived in Pebble Twp., Pike Co., Ohio, in 1850.